LOS ANGELES, CALIFORNIA, USA, November 1, 2018 /EINPresswire.com/ -- Tobi Tobin, Los Angeles lifestyle expert best known for her collection of hand poured candles, custom blended fragrances, and artisanal chocolates, announced today the debut of a new fragrance, Dark Chocolate Fruit to the existing collection of unisex Eau de Toilettes. Launching nationwide at Bloomingdale’s and at Hudson’s Bay in Canada. The Dark Chocolate Fruit Fragrance is the fourteenth fragrance added to the brand’s category and is inspired by Tobin’s delicious Dark Chocolate Orange Truffle. The fragrance opens with a rich Dark Chocolate Fruit aroma, while Orange Blossom, Pink Jasmine and Elemi invigorate the senses and crisp Cedar Wood and White Pepper round out the experience. “After many years of our customer’s asking if we make Chocolate Fragrance, I wanted to create a fragrance that combines two of my favorite scents – Dark Chocolate Fruit and Orange Blossom, both of which evoke happiness and comfort the soul,” says Tobin of the fragrance. The Dark Chocolate Fruit Fragrance, along with the rest of Tobi Tobin's range is unisex, appealing equally to men and women. Handsomely packaged in Tobi Tobin’s distinctive embossed crocodile with burlap and grosgrain ribbon, the fragrance is available in 3.3 oz. for $168.00 at www.tobitobin.com and Bloomingdale's Nationwide and at Hudson’s Bay. The Tobi Tobin Fragrance Collection consists of fourteen Eau de Toilettes, offered in two sizes, 1.7 oz. and 3.3 oz. The luxury fragrances are created in four different categories, Floral, Fruit, Citrus, and Woody Spice. Each luxury fragrance is individually designed as a custom blend by Tobin to elicit memories of her world travels. Tobi Tobin products have defined the wellness movement and transformed the approach to physical, mental and spiritual well-being. The term “clean” is not to be confused with “natural”, a term widely criticized for its ambiguity within the beauty industry. Today, the “clean” banner is carried by a small, but vocal group of individual brands, dedicated retailers, platforms and activists that have taken it upon themselves to define and uphold the strict guidelines around clean products. Tobi Tobin is proud to be seen as a leader in this space and looks to continue the clean movement in beauty with the launch of her newest fragrance and beyond. 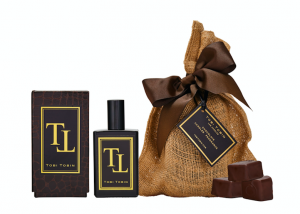 Tobi Tobin is a lifestyle brand consisting of hand poured candles, custom blended fragrances, and artisanal chocolates developed from Tobin’s successful career as an Interior Designer. The fragrances and candles can be mixed with Tobin’s handmade, dark chocolate truffles, entirely produced in Los Angeles. Each of the candles is a natural soy coconut blend and feature a 2 wick burning system to maximize fragrance release.